Custom WEB DESIGN Tailored to your needs. 50% OneTime Off | Code: "WEBDESIGN50"
We know how difficult you find to get a website launched. In majority cases you don’t have the time and expertise to judge what can be the best. Your website holds key to online success, where compromise cannot be an option. 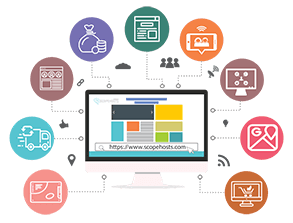 ScopeHosts offers wide range of Customizable Web Design Packages covering small, medium and large enterprises business. We offer large number of features to get your business website developed, based on your needs. Let our website designers build an most amazing and responsive website for your business. We will build your dream website at affordable price. Get your SEO ready website by opting our Best Website Design solution. Best Suited for hosting business startups, freelancers and established resellers. *Note: FREE Web Hosting service for a year. FREE SSD Web Hosting 1st Year. FREE Updates for 1st 6 Mo. After Delivery. Complete Rights - No Hidden Charge. Wordpress is the leading FREE CMS Platform, covering 27% of the websites on internet. Our Expert Team will create Custom Wordpress Website for you to totally Control and Update at Anytime. Our fully Managed Wordpress Hosting Package will make sure your site runs smoothly; they are Built and Optimized specifically to support Wordpress Websites. Integrate Wordpress Custom Website Design with your ecommerce business without any hiccups. October is one of the Stable CMS platform available on Internet. October CMS is built on Laravel PHP Framework Platform. More than 18k Projects Started on it. October CMS is Simple, Powerful and Reliable, you need not follow the complexity of coding to update the website. Just drop in your content, images and be at ease. October CMS based Custom Website Design can be Integrated Hassle Free with any ecommerce platform. We work on Internet Leading Open Source Content Management System(CMS) Platform Wordpress and One of the fastest growing platform October CMS. How to Get Started with Website Design? Follow Just 5 Easy Steps! For the Custom Website Designing Package , Contact Us ! 1. How long does it take to build my site ? Ans: Once you provide all the necessary content and images to be used on your site, it should take around 3 to 4 weeks to build your site of 8 to 10 web pages. But we try to complete your project as soon as possible with best responsive design and make your site SEO-ready. 2. What services do you offer in addition to the website creation service ? Ans: We ensure our customers have the best online presence, hence along with site creation we make the site responsive and integrates key aspects in the site such as Social Media Integration, E-commerce Cart Integration, Blog Integration and Google Map Integration. Along with these aspects we make sure that your website in SEO-Ready i.e, we perform all the On-Page SEO techniques on your site. 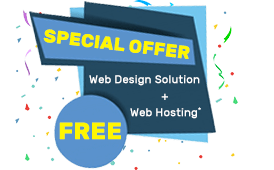 Also we provide Free SSD Hosting service for a year to get your website online. 3. Do you provide website maintenance ? Ans: Yes, we make that your site has the online presence unceasingly. Our experts are available round-the-clock to assist you if any queries are faced. If your site requires any updates to be done then we are available always to assist you. 4. How many pages can my website have ? Ans: Number of pages your site can have depends on your requirements. We create site for you as per your needs. As per search engines the website with more number and properly optimized pages rank higher. So you can have any number of pages on your site. 5. Are your sites mobile-friendly ? Ans: Every site we have built since 2008 has been mobile-friendly. We make sure that your website has responsive design and works well on different devices of varied screen size, from laptops to desktops and smart phones. 6. I already have a website, so can you just revamp it and provide regular maintenance ? Ans: Yes, we would be glad to revamp your existing site as per your needs and we do provide service to keep your site updated with latest techniques. 7. What platform do you use to create my site ? Ans: We use October CMS(Content Management System) and WordPress CMS platform for creation of your dream site. 8. What other platform do you use create site, if I do not want my site to be created on October or WordPress CMS platform ? Ans: If you do not wish to get your site created on these October or WordPress CMS platforms, then we create site using HTML 5 and Bootstrap. 9. Do you build Ecommerce site ? Ans: Yes, we do build ecommerce website. Also you can buy SSL certificates as addon to secure your website and encrypt your and your clients data and information against online threats. 10. Can you write content for my site ? Ans: Yes, we can write content for your site. You can contact our support team to get this custom service by our efficient content and copy writers. 11. Your design plan does not suit me, can I ask for custom design plan ? Ans: Yes, you can request for custom design plan. You just have to contact our designers to have a customized design packages. 12. Will I have a say in the site designing process ? Ans: Yes, our motto is to create a site as per your needs. We can’t achieve this without your input. You can suggest your views on site design style, we will create your site as needed by you and as per your inputs. 13. Will I be able to sell products on my site ? Ans: Yes, you will be able sell products on your site. We build and host your online store causing no hurdles for you. Also you are provided with SSL certificates as addons to secure your site’s sensitive information. 14. Do you even design mobile applications ? Ans: Yes, we do create mobile applications and we ensure that all our other created websites are mobile-friendly. 15. Can you register my domain name for my newly built site ? Ans: Yes. You can register a domain for your newly built site and get your site hosted by us. We strive to provide your site the best and unique online presence. 16. Do you update my wordpress site ? Ans: Yes, based on the latest technologies introduces in the WordPress, we keep updating your website. Regular site audit is conducted by us and we update your site as and when needed. 17. What is CMS ? Ans: CMS or Content Management System is a software application that provides very easy-to0use website interface to upload, edit and manage content of a site. CMS allows its users to edit, manage or publish the content from anywhere and at anytime. Content Management System provides publishing tools to users, which allows one or more users to update the content live on web.